VCU will host Binghamton tonight as a part of this year’s Battle 4 Atlantis tournament, the Rams last game before heading to the Bahamas Thanksgiving week for three games of action. VCU rides a two-game win streak to start the season into this one while Binghamton owns close wins over Cornell and Central Connecticut as well as a 16-point loss at St. John’s. While the Rams have looked far from anything resembling last year’s NCAA tourney team, they’ll have one last tuneup before the competition heats up in a week. The Bearcats are in year-six of a “rebuild” under head coach Tommy Dempsey, a rebuild that seems stuck on building a foundation. The Cats’ 8-22 record this past season was shockingly their best under Dempsey, but saw Binghamton’s least efficient offense in the process. This Binghamton unit will look virtually identical to last year’s squad plus as the Cats return almost all of their production from last year’s team that finished just 5-11 in the American East. That team was the third worst offensive unit in college hoops but did take a step up on the defensive end. In three games this season Binghamton has been considerably better on offense, hitting 40.3% of their threes, their biggest improvement from last season. Their turnover and two-point percentages however have kept the Cats below the 300 line in terms of national offensive efficiency rating. Binghamton will run roughly seven players in Friday’s game, but it’s sophomore JC Show who VCU’s defense will key in on in particular. Show leads the team with a 23-point average, Binghamton’s only double-digit scorer and dumped 34 earlier in the week in a win over Central Connecticut. Show is a high-volume shooter and isn’t afraid to launch the deep ball, hitting eight of his 11 threes in the win over Central. Binghamton has solid size for a low-major team so won’t be intimated by a VCU group that has opted to play small ball more often than not this season and comes into this one with leading scorer Justin Tillman having missed his last game due to a foot injury. The Rams survived a scare against a hungry Liberty team, getting a huge Mo Alie-Cox offensive rebound and two made free throws to give the Rams a game-icing five-point lead. With just one Liberty possession remaining. The win moved VCU to 2-0, albeit against a level of competition this era of VCU basketball is expected to dominate. With Tuesday’s scare Ram fans and coaches are all wondering how this VCU team gets back to looking like the NCAA tournament group they’ve been the past six years. Getting Justin Tillman back will go a long way toward that but the Rams will need to fix two key areas s well. The first and most urgent is in cleaning up the turnovers. VCU turned the ball over 19 times at Liberty, two games against turning it over 25 times against DII Queens University. The Rams are now turning the ball over one in four times down the court (24.2%), a stat they rank 308th nationally in. VCU turned the ball over just 16.3% of their possessions last season, ranking 60th nationally in that area. The Rams are also (as expected with the graduations of Melvin Johnson and Korey Killbury) struggling to hit shots from deep. VCU has hit 32.4% of their threes thus far, down from over 35% this past season and the worst season average since the 2011-12 unit connected on just 33.4% of their threes. Note however the similarities between this team and that. The 2011-12 unit struggled with single-digit wins over No.309 St. Francis PA and No.193 Western Kentucky, as well as blowout losses to Seton Hall and what proved to be a bad Georgia Tech team that season, but ultimately rallied to win the most regular season games in VCU history and made an NCAA tournament round of 32 appearance where they lost to Indiana in the last minute of play. That squad, this year’s years unit, buttered their bread with a suffocating defense while struggling on offense. Until someone steps up from three, that may have to become the model for this year’s team as well. Will Wade has made it clear this year’s Rams will play inside-out, meaning the Rams will try and attack the basket with their bigs before allowing guards to punish teams from distance. Looking at the percentages, you can see why that’s a good plan for this year’s VCU team. The Rams rank among the top-25 in the country in 2-point percentage but check in at No.181 nationally from deep. VCU can and will score inside the arc, so getting any bit of production from deep should signal a big loss for the Bearcats. If VCU can do a better job of not turning the ball over, VCU should — at least from what the numbers tell us — win big tonight. The key to beating VCU this year has been turning the Rams over. Queens University turned the black and gold over 25 times before winning on a game-winning basket in VCU’s exhibition opener. 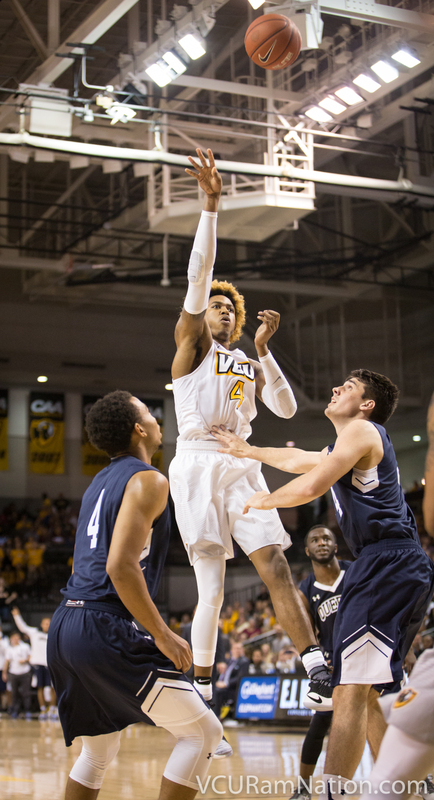 Liberty turned VCU over 19 times before narrowly losing in Lynchburg. VCU turnovers are a must for Binghamton if they want to leave Richmond victorious tonight but they’ll have to add in a good shooting night against what’s been a very stout Rams defense this season. Kenpom: 80-59 VCU win with an 97% chance of a Rams victory.